Review written by and copyright: Eric Cotenas (23rd January 2019). Two boys (On the Tightrope's Ladislav Jánsky and Railwaymen's Antonín Kumbera) escape a transport train bound for Dachau into the countryside. One trudges on ahead, focused solely on surviving the elements. The other lags behind, inundated by memories from the past into which reminders of their current situation slowly seep (even in the flashbacks, the boys continue to wear the coats branded with KL for "Konzentrationslager " that one of them has shed in the story proper despite the harshness of the elements). One craves closeness and communication. The other is disgusted with the nature that crawls and slithers beneath them, more so when he steps on a rusty nail. When the roles reverse, the gentler one is unnerved by his own violent and sexual impulses when they must seek food and shelter from others; however, they may be right to distrust when they are captured by a shooting party of elderly men made to feel important in the abuse of those deemed undesirable by the Fuhrer. The debut feature of Jan Nemec (The Party and the Guests) is an almost entirely visual adaptation of the short story "Darkness Casts No Shadow" by Arnost Lustig (Transport from Paradise) – Diamonds of the Night being the title of the anthology in which the story appeared before Lustig expanded it into a novel after the film – a semiautobiographical account of his escape with another teenage boy from a train that was bombed by an American pilot. What dialogue is present is entirely functional, and the non-professional actors are deployed as visual elements for the camera of Jaroslav Kucera (Daisies) and editing of Miroslav Hájek (Amadeus) which seeks to convey the immediate physical and psychological experience rather than the linear events. We do not even see how the two boys got off the train whether it was bombed or not, and the ambiguous ending does not convey anything of the biographical aftermath; but it is clear that the experience documented in the story to which the film is faithful apart from dropping much of the subjective narration continued to haunt the author long after and inform his writings. 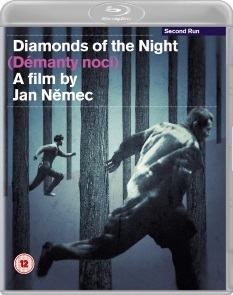 Released theatrically in the United States by Impact Films (A Bagful of Fleas and Something Different) and in the United Kingdom by Contemporary Films, Diamonds of the Night was previously released by on DVD by Second Run in 2010 individually and in the The Czechoslovak New Wave - A Collection box set with Intimate Lighting and The Cremator (both since upgraded by Second Run to Blu-ray). Second Run's 1080p24 MPEG-4 AVC 1.33:1 fullscreen Blu-ray is derived from a new 4K restoration by the Czech National Film Archive and opens with a statement that the restoration has sought to remove defects of the film element's archiving while retaining those that are side effects of the original shooting and processing. In spite of the disclaimer, the image is starkly gorgeous with the fine detail revealing an attention to tactile sensory detail that was obviously not the concern of Alain Robbe-Grillet's Slovak co-produced and lensed contemporary feature The Man Who Lies which possesses a similar high-contrast monochrome texture at times and similarly opens with a protagonist fleeing gunfire with the nature of his mortality left just as ambiguous though in a more playful manner. The forthcoming Region A-locked American release from The Criterion Collection will likely use the same master, but Second Run's mastering standards are of comparable high quality. The LPCM 2.0 mono Czech audio track has also been restored, cleaning up the surface noise but presumably retaining some faint hiss that was part of the original recording and re-recording methods. The optional English subtitles for the sparse dialogue are presumably the same as the 2010 release. Second Run's Blu-ray retains the extras from the 2010 DVD but also includes some new ones. First up is a new audio commentary by film historian Michael Brooke who cites the film as one of the first of the Czech New Wave with some of the movement's behind the scenes participants already in place including Nemec, cinematographer Kucera – assisted by future Milos Forman (The Fireman's Ball) cinematographer Miroslav Ondrícek (Red, White and Zero) – with costume design by Kucera's wife Ester Krumbachová (Valerie and Her Week of Wonders) who would become a sort of muse of the Czech New Wave, collaborating on the design as well as the screenplays of the films of Vera Chytilová (Fruit of Paradise). He also notes a further Forman connection in actor Jánsky who became a photojournalist and adapted the name Lady Jansky when he moved to the states and became a photographer for Rolling Stone and then Hustler, serving as a consultant on Forman's The People vs Larry Flynt. Brooke also reads passages from the source novel to demonstrate the differences between their onscreen equivalents and the film's overall fidelity to the source. He also offers interpretations of the film's ambiguous passages and its debt to surrealism – noting that Nemec was inspired by Luis Buñuel's Un chien andalou and Alain Resnais's Last Year in Marienbad and Hiroshima Mon Amour – and breaks the film's structure up into three distinct visual textures denoting the present, the past, and a dreamlike intermediate, as well as Nemec's use of tracking shots (one of which ate up a third of the budget) in deliberate contrast to his mentor's dislike of them in favor of montage. He also discusses the film's British critical reception and the Czech New Wave's influence on the British New Wave (nothing that Ondrícek would photograph Lindsay Anderson's If…). Also new is the inclusion of Nemec's short film A Lot of Bread [Sousto] (11:38) which also depicts the escape of three prisoners from a train. Also new is an interview with Eva Lustigova (17:28), daughter of author Lustig, who notes that Lustig referred to the Holocaust as the murder of Jews since holocaust has its Greek origins in the notion of a burnt offering or sacrifice. She sheds more light on the events o the story and reveals that Lustig and the other boy made it back to Prague and took part in the Prague Uprising. She reveals that her father was moved to write because people did not believe what he told them of his experience. Ported over from the DVD is an appreciation by critic Peter Hames (21:13) who covers a lot of the same information and topics as Brooke on the commentary while also discussing Nemec's experience in the West in which Hollywood was not to his liking but he became a pioneer in the use of video to record weddings. Also included is the film's theatrical trailer (2:03). Included in the case is a booklet featuring an essay by film historian Michael Brooke which has been ported over from the DVD with the biographical section on Nemec updated with his last credits and mention of his death. If the text comes across like a digest version of the commentary, it is a testament to Brooke's preparation and organization in his audio discussion.